These best salad recipes are our favorite salads. 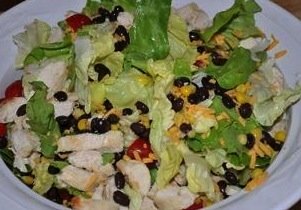 Whether it is a cobb salad, pasta salad, vegetable salad or fruit salad we've included a variety of dishes to add to your meals and in some cases be a main dish salad. You can share your great recipes too! 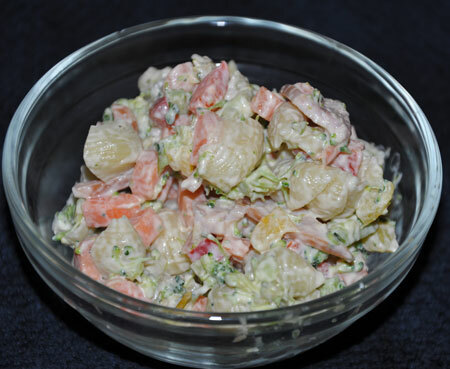 Fruit salad recipes including spinach strawberry salad recipe, classic waldorf salad and ambrosia salad. Add tomatoes, cucumbers, pepper, and onion in a serving bowl. Gently add in feta cheese and olives. In a small bowl or cup blend together olive oil, lemon juice, oregano, and season with salt and pepper. Drizzle over salad and serve. Boil water and cook pasta add peas and carrots last few minutes. Drain and rinse with cold water when tender. Stir together pasta peas and carrots and ham. 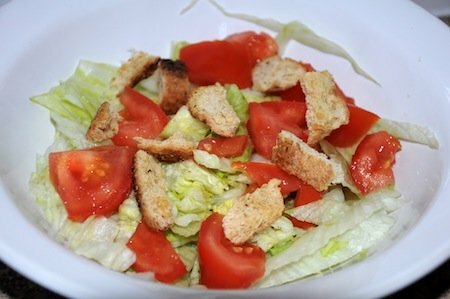 In small bowl mix dressing. Pour over salad mix and chill 4 hours. Boil green beans until tender and drain. Place in serving bowl toss with cheese, nuts and bacon. In serving bowl, blend three beans together. In measuring cup, stir together vegetable oil, cider vinegar, sugar and season with salt and pepper. Pour over bean salad and chill several hours. 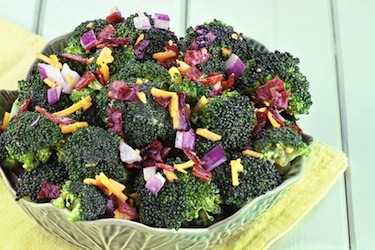 In a serving bowl, add washed and chopped broccoli. Add in celery, bacon, seeds, onion, swiss cheese and raisins. Toss salad ingredients together. In a measuring cup stir together mayonnaise, vinegar and sugar. Drizzle over salad and serve. See how to make salads in a jar here. 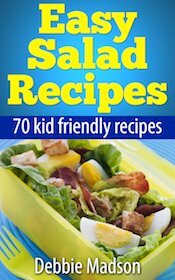 I love salad and my kids do too. However it was hard getting them to eat all the veggies I put in the salad. I decided I would try to chop everything to see if they would eat it. I chopped the lettuce(romaine and leaf lettuce) in very small pieces. I added chopped cucumbers, onion, carrots and peppers(reds and yellows). I then added chopped chicken. I pick up a magic chicken(the ones already cooked at the store, we call it magic because it is done and ready just like magic). We eat half of it for one meal then I chop the rest for the salad. It also is a great way to use the dark meat which my kids hate but can't tell the difference in the salad. After I mix the meat, veggies and lettuce I mix in the salad dressing which ever we are in the mood for that night. Then I dish it up in a bowl for everyone. I just made it all easy to eat in on a fork in one bite. It is delicious and everyone loves it. Not one thing is picked out and set to the side. They eat it all. We love it and have it about once a week. Makes for a quick easy meal. Mix the tomato, basil, and cottage cheese together in a leak-proof to-go container, drizzle with olive oil and sprinkle with salt and pepper to taste. I like this snack because I do karate, and it is light, refreshing, and healthy to eat. I take it with me when I am training at the dojo. 1. Mix all the food together well with your hands. In a ziploc bag add oil, limes, vinegar, mustard, garlic, salt and pepper. Add in chicken and seal shut. Marinate in fridge several hours. Grill. These go great on top of any of your best salad recipes. Cut French bread up into cubes. spread out on baking sheet and drizzle oil over, coating evenly. Bake in preheated oven for 5 to 8 minutes or until golden brown. 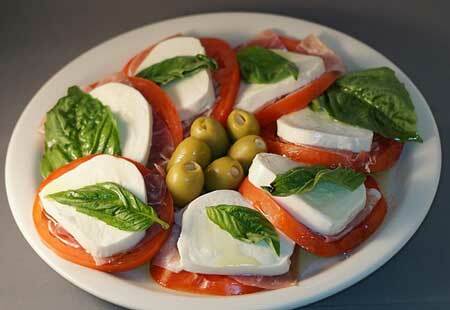 Dump immediately into large paper bag and sprinkle in the garlic salt and Parmesan cheese. Shake the bag vigorously until croutons are coated well. Dump out onto rack and let cool. Store in tightly sealed container in a cool, dry place, and use as needed sprinkled over salads and casseroles. 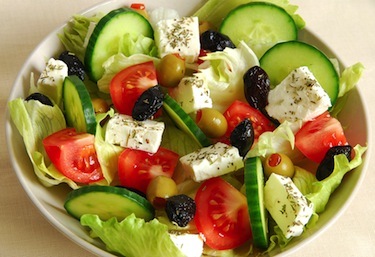 Do you have best salad recipes to share?